Favorite fairy tales are updated and hauntingly reimagined by twenty of todayâ€™s finest writers of fiction and fantasyOnce upon a time, all our cherished dreams began with the wordsÂ once upon a time. This is the phrase that opened our favorite tales of princes and spells and magical... read more adventures. 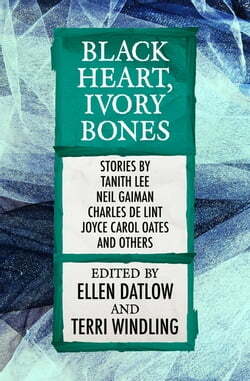 World Fantasy Awardâ€“winning editors Ellen Datlow and Terri Windling understand the power of beloved storiesâ€”and inÂ Black Heart, Ivory Bones, their sixth anthology of reimagined fairy tales, they have gathered together stories and poetry from some of the most acclaimed writers of our time, including Neil Gaiman, Tanith Lee, Charles de Lint, and Joyce Carol Oates. But be forewarned: These fairy tales areÂ notÂ for children.A prideful Texas dancer is cursed by a pair of lustrous red boots .Â .Â . Goldilocks tells all about her brutal and wildly dysfunctional foster family, the Bears .Â .Â . An archaeologist in Victorian England is enchanted by a newly exhumed Sleeping Beauty .Â .Â . A prince of tabloid journalism is smitten by a trailer-park Rapunzel .Â .Â . A clockwork amusement park troll becomes sentient and sets out to foment an automaton revolution. These are but a few examples of the marvels that await within these pagesâ€”tales that range from the humorous to the sensuous to the haunting and horrifying, each one a treasure with a distinctly adult edge.